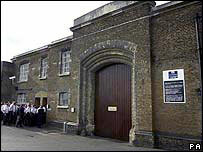 Improvements at south London's Brixton Prison have been held back because of poor facilities, a report has said. The report came after an unannounced inspection earlier this year. Chief inspector of prisons Anne Owers said the prison was "still not performing sufficiently well" in three out of four key areas. It found only 25% of prisoners had meaningful activities, there were no workshops and poor accommodation for the mentally ill. The report also said the prison had inadequate physical education facilities and a kitchen that was sub-standard. It reported the "healthcare in-patient wing had a limited regime and relied too much on agency nurses, while the basement area, holding the most severely mentally ill patients, was unacceptable with cold, concrete floors and graffiti-covered walls". It had, however, improved safety within the prison, introducing an anti-bullying scheme, and prisoners spent more time outside of their cells. There were also improvements in resettling prisoners. The prison was inspected in February and March of this year. It had last been inspected in 2004. Prison Service director general Phil Wheatley said: "The chief inspector is right to highlight the challenges of operating in a Victorian prison which is difficult to maintain and that has no workshop facilities. "As the chief inspector noted investment is required and I am pleased that plans are well advanced to redevelop both the kitchen and healthcare areas with work anticipated to begin in 2007/08."